A few months ago, early in the state legislative sessions, we reported on how lawmakers in nine states had introduced bills that would penalize electric vehicle (EV) drivers by charging higher registration fees. Now that the state legislative sessions have mostly wrapped up, it’s time for a review of how these bills fared, and how many states have implemented this extra financial burden on anyone who buys or leases an electric car. 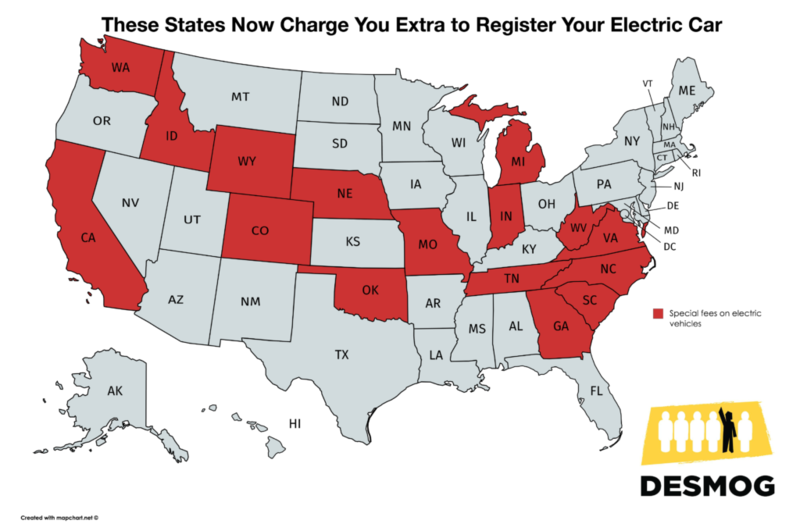 At least three of the sixteen states now charging higher registration fees for EVs also have some sort of rebate or incentive for their purchase. California, Washington, and Colorado all offer tax credits off the purchase price of the vehicle, credits which more than off-set the premium registration fee. Realistically speaking, these extra fees probably won’t deter too many buyers, as the overall cost of operating EVs (considering fuel costs and maintenance) is so much lower than for gas-powered vehicles. But even so, they are penalizing consumer behavior that states should be encouraging. These fees are also being mistakenly positioned as the solution to the very real problem of diminishing highway funds. Gasoline taxes typically pay for highway funds, but these revenues are shrinking as conventional vehicles become more fuel efficient and as gas taxes have failed to keep pace with inflation. Because EV drivers don’t buy gas, proponents of these EV registration fee bills argue that they need to pay their fair share for use of the roads. There are other reasons, by the way, that EVs should be given a break on registration fees — they actually cause less road damage given their light weight, and improve air quality and benefit public health because they don’t have tailpipes spewing dangerous emissions. As it stands, nearly one-third of states now charge EV drivers an annual premium not to consume gasoline and spew air pollution. Sure, states need to figure out how to pay for roads. But annual fees on EVs isn’t the answer. This was originally published on DeSmog.